The Rad Dudecast Our next clips is from Epi 220, "It's Racially Enhanced," of The Rad Dudecast, featuring New York standup comedians and best friends Anthony Devito, Brendan Eyre, and Greg Stone. Greg got a new character from Scotland, the boys break down how to podcast, and Brendan talks about his album recording. Not A Huge FanI'm not sure exactly which episode of Not A Huge Fan our next clip is from, as it was submitted directly to us from Charles Disney, a standup comedian and the host of the show. And thank YOU, Charles, for supporting this soundcast with your contribution. 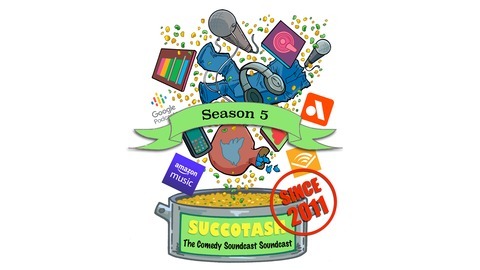 If you are a comedy soundcaster and would like to submit a clip to Succotash, we make it SO easy! 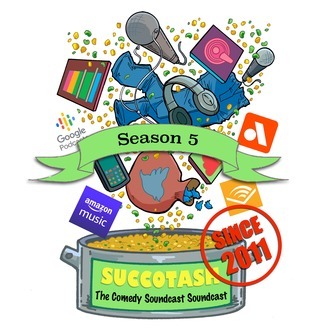 Just get your 3-5 minute MP3 or WAV clip ready then upload it at http://hjightail.com/u/Succotash! Dylan Brody's Neighbor's Couch RevisitedRecently, myself and former-host-now-executive-producer Marc Hershon were guests on Dylan Brody's Neighbor's Couch Revisited, a "podcast about a podcast" as it calls itself.